Last week I spent a few nights away at a training workshop down south. Unfortunately the workshop itself did not live up to its reputation, but there were a few other good things I took away instead. For one, I made some lovely friends and had a ball outside of the workshop. Secondly, I fell in love with juices. One in particular included beetroot and carrot and a few other ingredients, and was red and frothy. This may sound a little gross but it looked a bit like blood with coagulate on the surface. We laughed about drinking the blood of our enemies, and I felt great afterwards. I was inspired to create my own version at home. Its a power drink! The Dragon and I usually just do smoothies in our nutrininja. Usually we take a banana and almond milk base, then add various fruits/veggies/other add ins. We don’t really do much juicing. Juicers themselves seem a waste because they take out all of the good fibre, so the nutrinja seemed like the perfect way to start making yum juices at home. We have been having this particular one with breakfast every day this week and we have been feeling really healthy as a result. I’ve been pre-chopping all the fruit and veg on the weekend so they are ready to assemble in the nutrininja cup each night before bed, put into the fridge, then in the morning we can just grab, blitz, laugh maniacally and go! From my very un-educated trawl of the internet, pseudoscience tells me that this may benefit blood pressure, the liver, kidneys and pancreas, but just eating healthily generally will do that for you. Don’t be fooled into thinking drinking one juice is going to make you healthy, but in combination with a balanced and healthy diet generally, this juice is a great addition. 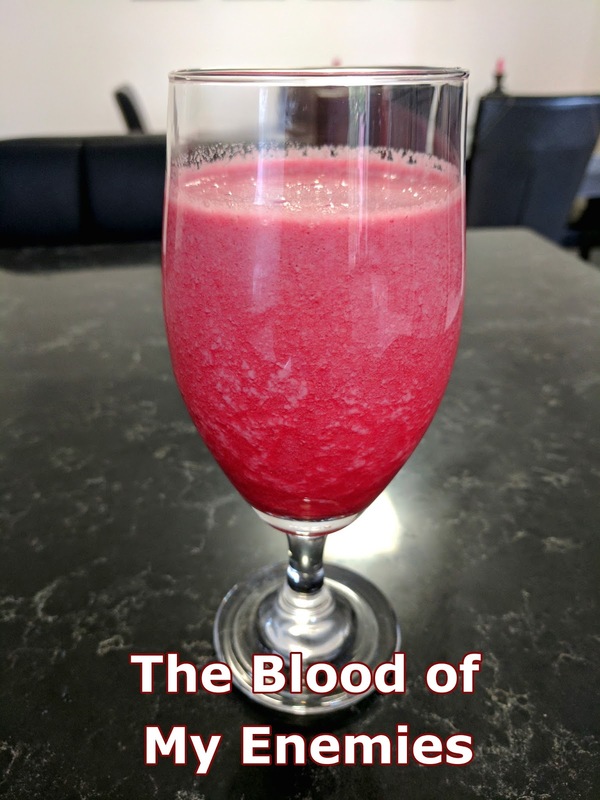 I present to you the Blood of My Enemies. Serves 2, please ensure all ingredients are cold. Add rockmelon, pineaple, celery, beetroot, ginger and coconut water to your nutrininja. Blitz using the “ultra blend” setting. Don’t be put off by any froth – that’s some good fibre, right there!